Discovering of one of Myanmar’s ancient Kingdoms where tourists seldom visit. In this Myanmar tour, you will realize the importance the city had centuries ago and witness the abandoned Mrauk U’s remarkable ruined temples and study the cultural and a heritage. You may combine this tour with other packages. Transfer to the airport in Yangon for your domestic flight to Sittwe. On arrival in Sittwe, the capital of Rakhine Stat, take local boat along Kaladan River on boat trip to Mrauk U (appx: 5 hours), a major archaeological site in Myanmar. Transfer to your hotel. Mrauk U was once an important trading post with links to Portugal, Holland, Arabia, Persia and India. Almost forgotten, you’ll have the chance to rediscover this town and see this multi-national influence on the city. 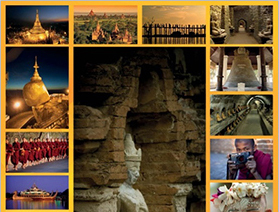 You will witness the former grandiose of this ancient town, famed as Myanmar’s second eminent temple site after Bagan. Overnight in Mrauk U. Enjoy sunrise from the top of the hill. After breakfast continue sightseeing in Mrauk U with a visit to the market, the ruins of the Royal Palace and the Archaeological Museum. After lunch, visit Shitthaung Temple, Mrauk U’s most important monument, built in 1535 by 1,000 architects and containing a remarkable collection of Arakanese Buddha images and reliefs. Continue to the multi-spire Andawthein Ordination Hall, with its unique stone carvings, the circular Ratanabon Pagoda, Dukkhanthein, a huge fortress-like temple with vaulted passages containing interesting stone sculptures and Laymyetnha, the first pagoda erected in Mrauk U in 1430. After breakfast transfer to Sayoh jetty (approx: 30 min). Then, take a boat along the Lamyro River to the remote Chin tribal village. The women in this village are decorated with tattoo on their faces. Stroll around the village or trek to another village before returning to Mrauk Oo by boat. Stay overnight in Mrauk Oo. Depart with local boat from Mrauk U to Sittwe. On arrival in Sittwe transfer to airport for flight to Yangon.